If your child plans to play Mite Hockey (Mite Travel or Cross Ice League) for the 2012-13 season, please pre-register at http://www.surveymonkey.com/s/QG5LPR3. Pre-registration is free and no commitment is required at this time. The data collected will allow for proper planning for the 2012-13 season. 1) Full Ice vs. Cross Ice. Full ice is the traditional way hockey is played. It uses the entire sheet of ice just like a professional game. 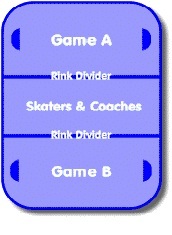 The cross ice hockey game is played across the width in one zone. This format can allow 2 games to be played at the same time. It is generally thought that this is a better way for developing players in the game of hockey. This is why USA hockey has mandated that a certain amount of games on Mite travel teams must be played cross ice. The use of cross ice for teaching hockey skills is called the American Development Model (ADM) by USA Hockey. Visit www.admkids.com for more information. 2) CHC Stands for Connecticut Hockey Conference. This is the Connecticut subsidiary of USA Hockey which governs hockey in the USA. Northwestern Hockey plans to field at least 1 travel team on the Mite Level. A second travel team will be formed if there is an appropriate amount of players interested in playing Mite travel hockey. Travel hockey is recommended for families that are interested in dedicating the most amount of time to the game of hockey. It generally consists of 4 on-ice sessions per week. One game played on Saturday, and another game on Sunday. One of these games will be played at one of our home rinks and the other will be played away somewhere in the western Connecticut area (usually within an hour drive time). A portion of the games will be played cross ice as mandated by USA hockey. There will be tryout evaluations for the travel teams. There will be no fee for Mite tryouts and all Mite players and families are encouraged come out. Tryouts for the 2012-13 season are expected to take place in early September 2012. The home rink for the Mite A Travel Team will alternate between Canterbury, Gunnery and Rumsey as do all the travel teams. The Mite A travel team is allowed by CHC to play up to a maximum of 35 full ice games. (Excluding all tournament games). The full ice games are played with referees and a live scoreboard. The CHC requires a minimum of 15 cross ice games per season. Practices are focused on cross ice concepts for the development of skills. Practices are held twice a week in addition to the weekend games. There will be one holiday tournament as well as a season end state sanctioned tournament. The Mite "A" Travel Team season runs from October through February. The home rink for Mite B Travel will alternate between Canterbury, Gunnery and Rumsey as do all the travel teams. The Mite B travel team will be formed if there is an appropriate amount of players interested in playing Mite travel hockey. CHC mandates that only cross ice games be played at the Mite B level until November 1st. A maximum of twenty full ice games are played. The full ice games are played with referees and a live scoreboard. CHC requires a minimum of twenty cross ice games per season. Practices are focused on cross ice concepts for the development of skills. Practices are held one to two times a week in addition to the weekend games. There will be no tournaments in the Mite B program. The Mite "B" Travel Team season runs from October through February. The Northwestern Mite Cross Ice League is for players who will not be playing on a mite travel team. It is open to players ages 8 and under who have completed Intro to Hockey. All games are played in the cross ice format and will be at one of the home rinks (Canterbury, Gunnery, Rumsey). Determined by the number of registrants, teams of 8-12 players will be formed with the intent of creating balanced teams to encourage skill development across all ability levels. Based on registration numbers from past years, we expect to field 4-8 teams. In addition, players will be assigned to teams based on their preferred rink (Canterbury or Gunnery). Teams will be assigned a name and players will be given a unique jersey for their team. If coaching support allows, each team will be assigned a primary coach. The program will consist of up to 3 ice sessions per week. The teams will practice in a group setting for one hour on one day on the weekend at their preferred rink. One hour cross ice games will be played on the second day of the weekend, with the location of the cross ice games rotating between the Canterbury and Gunnery rinks. All teams will also have an opportunity to participate, from time to time, in cross ice jamborees with neighboring towns (like Watertown, Kent, etc.) In addition, as an added bonus, all players may participate in a 1 hour skills clinic during the week held at the Rumsey Hall School rink. The regular cost of the weekly skills clinic is $10 per clinic, however, players registered in the Cross Ice Leage can attend for free. The Cross Ice League runs from late October through February.